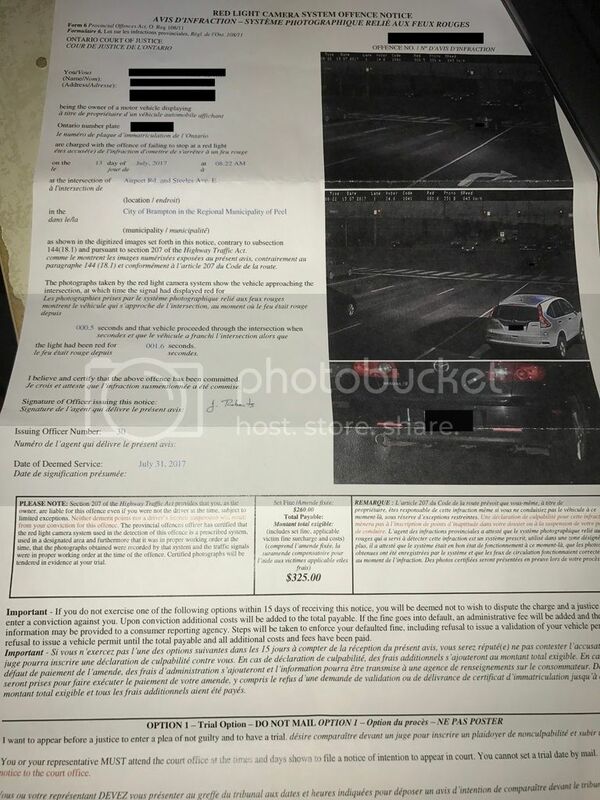 I received a red light camera ticket today and I really need advice on how to proceed forward. Let me first explain what happened. I was on the right most lane and was driving about 45 Km/h. As I was approaching the intersection, there was a truck on the left side of me, so I couldn't see the traffic light on the left and there was a jeep in front of me and I couldn't see the traffic light for majority of the time. By the time i was able to look at the traffic light, I saw it turn from yellow to red and I had about 2-3 seconds to reach the white line for stopping. But considering my speed and the fact that it had been raining, I didn't stop and passed the red light fearing that I would stop in the middle of the intersection. I don't know how strong my case is. I have never received any ticket and my driving record is clean. Please advise. I am also attaching my ticket for more information. itsagam wrote: I don't know how strong my case is. I have never received any ticket and my driving record is clean. Not to sound harsh, but driving oblivious is not a defense. Also, it's an absolute liability offense. That means you either did or didn't drive through the red light. There's no middle ground. Luckily, red light camera tickets are glorified parking tickets. You can try to have the fine reduced or just pay it and move on. There's nothing more to these tickets. They don't know who was driving so they send it to the owner of the plates. It has nothing to do with your license. They are also impossible to beat. Sometimes you just have to pick your battles. Example, an honest paralegal wont even touch red light camera tickets. Since there's no insurance or license implications, it's cheaper to just pay it. These are not impossible to beat, but would require hiring a paralegal AND hiring an expert witness that can testify about the problems with these devices, so most likely the cost to fight it is going to be more than just paying the ticket. Since the ticket is charged to the OWNER of the vehicle (not the driver), there are no demerits and no insurance implications to worry about so the only cost is the fine itself. You should plead NOT GUILTY and request a trial with the officer present. Once you get the Notice of Trial, then you can request disclosure (officers notes, make/model of device). Then show up for trial date and if officer is not there then ask for ticket to be withdrawn. If officer is there, then ask about a reduction in fine. Worst case is the fine does not get lowered and you pay original fine, and best case is that you get it reduced further. Paralegals don't deal with red light tickets as is, let alone billing additional hours on top of that. ShrekTek wrote: request a trial with the officer present. What officer? No officer needs to be present. ShrekTek wrote: you can request disclosure (officers notes, make/model of device). ShrekTek wrote: Then show up for trial date and if officer is not there then ask for ticket to be withdrawn. So should I select option 1, go to trial and try requesting a reduction of the fine ? An officer MUST review the pictures and sign that they beleive the charge is correct and that they believe the camera system was in proper working order, so this officer MUST come to trial to testify to this information. They may not have any notes regarding the event, but they still must sign the ticket and that means they need to appear in court if you ask for a trial. Consider is that Section 4 (1) of the regulation, it says the officer needs to serve you (by mail is fine) within 23 days of the offence. According to the ticket, what is the deemed service date? On the surface this deemed service date may seem okay, however I would cross-exam the officer on this point. Did the officer put the notice in an enevelope himself, put a stamp on it himself, and then place it in a Canada Post mailing box himself? If he simply signed it but then left it for somebody else to mail, then how does he know what day is was mailed? The section says that you may be served when the officer "sending the offence notice by regular prepaid mail or courier". I would argue that unless the officer put the letter in the mail box himself (or took it to the post office himself) how can he know for sure that it was "mailed" on a specific day for sure? It is certainly possible that the person who mails them out had it sitting around on their desk for a few days before they got to the post office. Also consider cross-examining the officer on the what it says at the bottom of the ticket in the PLEASE NOTE section. "The Provincial Offences Officer has certified that the red light camera system used in the detection of this offence ... was in proper working order ... traffic signals were in proper working order". So this would bring up questions like "Officer did you go out and test this system? How did you test? When did you test? How do you know it can accurately measure speed of moving vehicle? How do you know traffic lights were working properly that day? Did you observe them?" If the officer does not provide any notes for disclosure, then how can they testify that they know it was in proper working order? If you call around to various paralegals, you will eventually find one that would be willing to take it. Can they win? Maybe, maybe not. I would suggest you ask for trial and ask for disclosure (officers notes) and see what you get. If you get nothing with regards to "proper working order" of the system, then you have a good chance to beat it. But again, you need to find a paralegal that is good at cross-examination or do it yourself. Alternatively, ask for the trial and then show up and talk to prosecutor about reduced fine. Just so you're aware, the Provincial Offence Officer who certifies, does NOT have to appear in court just because you want them there. You're not likely to get a JP to order the appearance. 205.20 (1) The provincial offences officer who used the evidence obtained through the use of a red light camera system to identify the owner or driver of the vehicle involved in the alleged offence and who issued the offence notice and certificate of offence shall not be required to give oral evidence at trial unless a summons requiring the officer to attend is issued at trial under section 39 of the Provincial Offences Act. 1998, c. 38, s. 4. (2) A provincial offences officer who certifies that a photograph was obtained through the use of a red light camera system shall not be required to give oral evidence at trial unless a summons requiring the officer to attend is issued at trial under section 39 of the Provincial Offences Act. 1998, c. 38, s. 4. (3) No summons shall be issued to a provincial offences officer referred to in subsection (1) or (2) unless a justice is satisfied that the defendant will not be able to have a fair trial if the officer is not required to give oral evidence. 1998, c. 38, s. 4. Well okay so you will have to ask JP for a summons to get officer to court. You need to say that you want to cross examine the officer on their statement that the camera was in proper working order and the lights were in proper working order. If you received notes in disclosure then you can say that based on the notes you want to question them on this. If you did NOT receive any notes for disclsosure then even better because you can say that the fact that no notes were provided regarding how the officer knows the device was in working order, means you should be allowed to cross-examine them on this issue. How can you have a fair trial if you are not allowed to cross-examine the officer on their statement that the camera system and lights were working properly at the time? itsagam wrote: So should I select option 1, go to trial and try requesting a reduction of the fine ? If you would like to plea bargain for a lower fine then select option 1 and request a trial. You can meet with the prosecutor on the day of your trial and see if they are willing to offer you a reduced fine. While there are no guarantees, it is very likely that prosecutor will be willing to reduce your fine in exchange for a guilty plea. there's a saying "if you can't do the time, don't do the crime"
Jumping red lights are dangerous, I was in a tbone, because the other driver did just this, so my perspective is fairly harsh on this. When driving you should be 100%, actually 110%, your concentration should be on driving. As already stated, it's a glorified parking ticket. you could have injured yourself or another and ALSO got a ticket for that.